Built on the reliable Bus4x4 4WD conversion kits or with original 4×4 drive train, our 4WD systems are true off road systems, with High and Low Ranges (depending on the vehicle and model) and raised suspension to improve clearance. 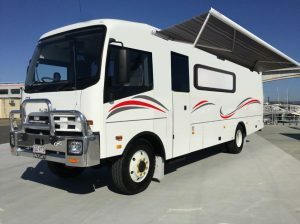 Toyota Coaster, Commuter and Landcruiser are Australia’s popular vehicles for motorhome conversions because of their reputation, reliability and healthy fuel economy. The I-Bus motorhome is built on an Isuzu engine and drive train with a walk through interior and loads of features. Currently the models available for conversions are the 300 Series, 600 Series & 800 Series. The Iveco cab chassis is an ideal platform for a motorhome with its high performance configuration and an ideal walk through interior. Currently the models available for conversions are the Daily and Tonto. From time to time we build out of the box motorhomes like the Toyota Bush Bus or Toyota Landace. 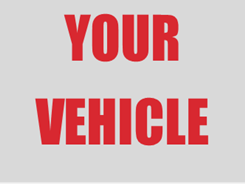 If you have anything specific in mind or only want us to convert your vehicle, please call us and we’ll be glad to help. Our professional fit-outs are built with cutting edge materials and maximise design for ample storage and space. 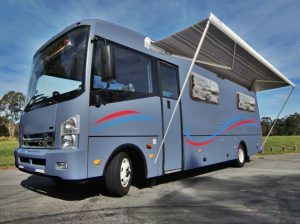 Our motorhome build focuses on your comfort while our vehicle focuses on taking you anywhere off-road. At 4×4 Motorhomes we manufacture our conversion kits. Our 4×4 conversion kits are all Australian designed and built. We warrant our workmanship and parts and know you will enjoy taking our vehicles to places without sacrificing comfort. To visit 4X4 Motorhomes Australia website click HERE!